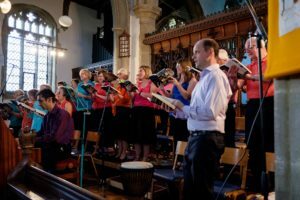 We are a friendly, small choir with community spirit who perform our own concerts and contribute to local events throughout the year. Our members come from a wide area in South Cambridgeshire, including the villages of Swavesey, Over, Willingham, Fenstanton, Fen Drayton and Hilton, and the towns of St Ives and Huntingdon. 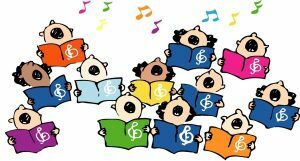 If you have always enjoyed singing then we would love you to come and join us. 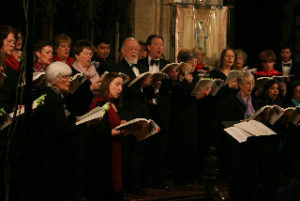 We welcome everyone, whether you just enjoy singing in the car or have years of experience. Feel free to come and try us out any time. We meet during term time on a Wednesday evening from 7:30 to 9:00 pm in St Cecilia Hall, Swavesey Village College. We have a short break in the middle to socialise and eat cake. New members will find a warm welcome and a supportive environment. There are no auditions, nor is it necessary to read music. Singing and smiles is what we are all about!